Beautifully crafted bellows will blow your flames to life. Traditional look--too pretty to put away! "This is a great bellows if you have a ceramic grill like a Big Green Egg or Primo. You can go from a cold grill to 500+ degrees in about 15 minutes if you use a good hardwood charcoal and the bellows. It's MUCH faster than lighting the grill and waiting around for it to get hot." The nozzle on the bellows is too wide. Imagine blowing on a fire, but with your mouth wide open. Useless for starting a fire. And what's worse, it was a Christmas present. I do not recommend. Lehman's says: We are sorry you are unhappy with this product. Please contact us: 1-800-438-5346. 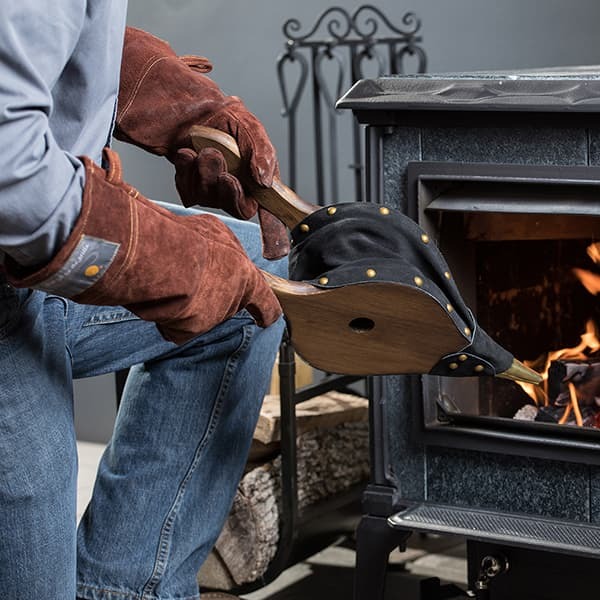 As bellows go, these are just the right size and shape, made by people who put care and craftsmanship into their work, you can tell just holding them. The wood has a strong yet soft feel and the leather is supple. High quality and made by hand, it only takes 3-4 puffs to restart those slumbering coals. You will be happy to have these bellows by your fire. This is a great bellows if you have a ceramic grill like a Big Green Egg or Primo. You can go from a cold grill to 500+ degrees in about 15 minutes if you use a good hardwood charcoal and the bellows. It's MUCH faster than lighting the grill and waiting around for it to get hot. I wish I had bought this bellows many years ago. It is very functional in starting a fire with a mere ember beneath tender in the fireplace. We have a roaring fire in minutes! 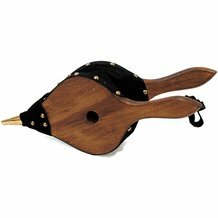 Made from wood, leather and brass, this bellows is beautiful as well as useful. I highly recommend this item. I love shopping at Leahmans because it is like going through the 'way-back machine' -- way back to when things were made in the USA; made well and priced to sell. This is a beautiful bellows. It doesn't look brand new, so it feels like a find in an antique shop. Great weight and a good bit of air without killing yourself. Everything I have gotten from Lehman's has been just as advertised...high quality, delivered with impeccable care and priced very fairly. Recently bought this item to replace a cheap bellows that we bought elsewhere. It is well made and attractive. It met our expectations for practical use as well. High quality! I just recently purchased this bellows from Lehmans. The quality of the bellows is outstanding. The leather work and woodwork that have gone in to creating this is very impressive, you can really see the care that was taken when crafting these bellows. I am sure I will be using these for years and years. After using these bellows and seeing similar products at a much higher price point, I am over all very pleased with my purchase. I am a CSR @ Lehman's. This item is beautifully crafted, and well worth the $. Definately a good investment for your fireplace.